Are you ready for the Sivananda teacher’s training course ? The Sivananda Teachers’ Training Course (TTC) is available in many different countries around the world, and in a variety of languages. For TTC dates, locations and languages consult the schedule. From that page you can apply online. The TTC began over 40 years ago, is recognized worldwide and has produced more than 26,000 graduates. Swami Vishnudevananda was the first in the West to develop this kind of training program for yoga teachers with the vision to not only develop successful yoga professionals, but also to spread peace in the world through them. 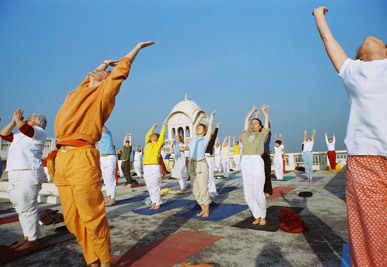 The TTC is a unique, profoundly transforming and personal experience that is based on the ancient gurukula teaching system which integrates the student’s daily life into the yoga training. For four intense weeks of ashram living, students strenghthen their own yoga practice through self-discipline and awareness of the nature of mind, body and spirit. They also build a firm foundation from which to teach others instinctively and confidently. Categories: Yoga info | Tags: course, teacher, training | Permalink. Make Yoga a spiritual reality in your daily life. Become a practical Yogi.